Rome (AP) — Andre De Grasse isn’t interested in taking over from Usain Bolt as the world’s best sprinter when the eight-time Olympic champion retires later this year. “I’m trying to win this year. I feel like I have a great chance and that’s what I want to do,” De Grasse told The Associated Press as he looks forward to racing the Jamaican great at the world championships in London in August. The 22-year-old De Grasse took silver behind Bolt in the 200 at the Olympics in Rio de Janeiro and bronze behind Bolt and Justin Gatlin in the 100. Having also anchored Canada to a bronze medal in the 4×100 relay in Rio, De Grasse became the first Canadian sprinter to win three medals in a single Olympics. De Grasse pushed Bolt so hard in the semifinals of the 200 in Rio that Bolt acknowledged it was draining and prevented him from improving his world record a night later. 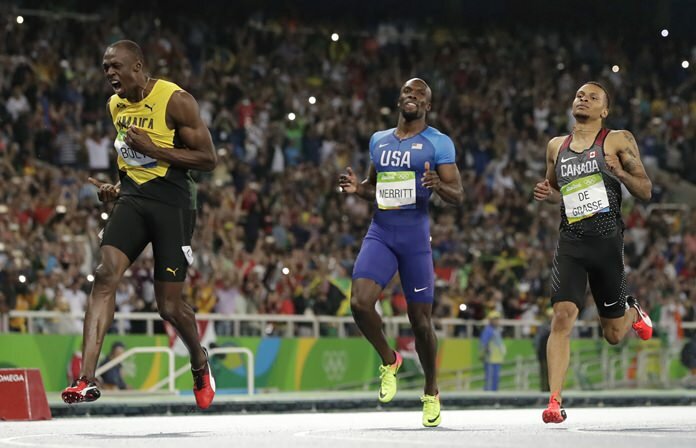 At the worlds, Bolt is set to appear in two events. “Usain is planning to run the 100m and 4x100m at the World Championships,” Ricky Simms, Bolt’s manager, wrote in an email to The AP. So what would it take to beat Bolt in the 100 in August? De Grasse is working on improving his starts, which also happens to be the only area that Bolt struggles in. As a teen, De Grasse ran one of his first races wearing basketball shorts and borrowed shoes. He stood up in the blocks while others crouched. It launched his career and led him to signing a big contract with Puma — the same company that sponsors Bolt.